This paper investigates a problem of determining the optimal terminal-time or time-to-go of the ZEM/ZEV (Zero-Effort-Miss/Zero-Effort-Velocity) feedback guidance law for a variety of orbital intercept or rendezvous maneuvers. A generalized ZEM/ZEV guidance problem, whose objective is to minimize a combination of the control energy and terminal time, is examined. Algebraic equations whose solution provides the optimal terminal-time of the orbital intercept/rendezvous problems are derived based on the optimal control theory. The effectiveness of the proposed approach is demonstrated for various orbital maneuver problems. Jaemyung Ahn is an associate professor of aerospace engineering at the Korea Advanced Institute of Science and Technology (KAIST; Daejeon, South Korea). His research interests include system design and optimization, dynamics and control of aerospace vehicles, and analysis of complex systems. He received his B.S. and M.S. degrees from Seoul National University, in 1997 and 1999 respectively, and Ph.D. degree in aeronautics and astronautics from MIT, in 2008. Pengyu Wang received his B.S. degree in automation from Harbin Engineering University, China, in 2015, and M.S. degree in control science and engineering from Harbin Institute of Technology, China, in 2017. He is now a Ph.D. candidate at Harbin Institute of Technology focusing on the development and application of control theories in aerospace problems, including Mars pinpoint landing, spacecraft rendezvous, and missile impact-time guidance, etc. Yanning Guo received his Ph.D. degree in control science and engineering from Harbin Institute of Technology, China, in 2012, and was a visiting scholar at Iowa State University from 2010 to 2011. His Ph.D. was under the direction of Prof. Ma, and he has published several conference and journal papers with a primary focus on spacecraft attitude control using angular momentum exchange. Currently, he is an associate professor at Harbin Institute of Technology, and specializes in optimal control, sliding-mode control, as well as visual navigation and localization. Bong Wie is a professor of aerospace engineering at Iowa State University. He is the founding director of the Asteroid Deflection Research Center established in 2008 at Iowa State University. He received his M.S. and Ph.D. degrees in aeronautics and astronautics from Stanford University, in 1978 and 1981, respectively. In 2006, the AIAA (American Institute of Aeronautics and Astronautics) presented Prof. Wie with the Mechanics and Control of Flight Award for his innovative research on advanced control of complex spacecraft such as agile imaging satellites, solar sails, and large space structures. This work was prepared under a research grant from the National Research Foundation of Korea (NRF-2013M1A3A3A02042461). The authors thank the National Research Foundation of Korea for the support of this research work. DerAstrodynamics. 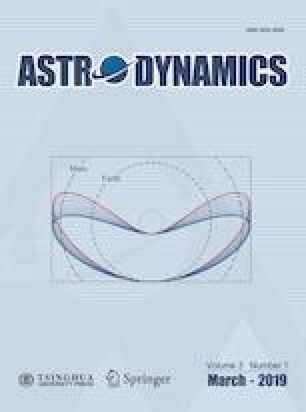 https://doi.org/derastrodynamics.com (accessed May 4, 2018).